Imprint Method: Unimprinted - Keep your brand afloat when you advertise on this Folksy Cotton Tote Bag! Made of 12 oz. cotton canvas, it's available in several accent colors and measures 19 1/2" x 14" x 7". 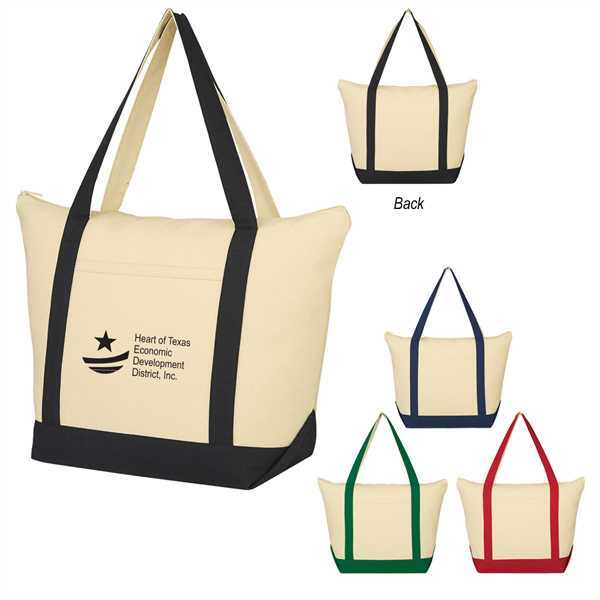 This bag features a top zippered closure, front pocket, 7" bottom gusset and 23 1/2" handles. It's a great product to hand out at tradeshows, grand openings and other marketing opportunities. Recipients can spot clean and air dry to keep it looking fresh while they show off your custom imprint! Size: 19 1/2 " x 14 " x 7 "
Imprint Size:6" x 6", 5"